Hey! Thanks for checking this build out. We’re using Rattlecage because this build is designed to be well rounded, and with that pure damage began to take a backseat. Rattlecage’s added spell damage boosted my spell damage from ___ to ___. Also, because this build plays tank and plays solo, the extra health helps. If you can, get all health or magicka enchantments, along with divines. I use Engine Guardian because this builds survivability really centers around making sure that you don’t run out of resources. 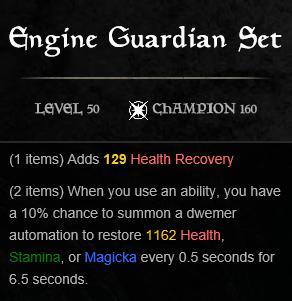 Engine Guardian really helps with sustain. Plus, that health recovery boost can also go a long way. 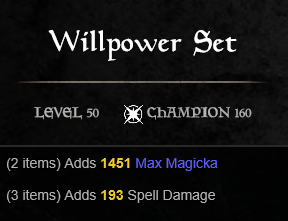 Willpower gives us more magicka which is always nice, along with some bonus spell damage. 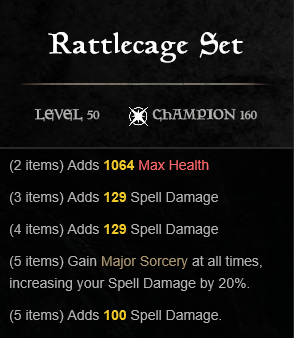 I have my jewelry enchanted with magicka recovery, just because it’s so vital to the build, but if you think that’s overkill, I would suggest spell damage. For this build, the specific weapon doesn’t really matter, the biggest thing is that they’re one-handed swords for the twin blade and blunt passive. I use Heavy Armor in this build for the excellent passives. Constitution, Wrath, and Rapid Mending all provide an excellent addition to this build. By far, this is the best execute in the game. When the boss gets below 40% health, laser beam them. Our gap closer. The added stun is nice for PvP. This is our bread-and-butter skill. Not only is the damage output fantastic, but I get healed from this ability alone more than honor the dead. After running through our rotation on the back bar, (I will explain in more depth later) this is our spam ability. This build doesn’t really focus on critical damage, but the additional 10% increase is always nice, and the 5% magicka boost is always appreciated. This skill is amazing. With this you get an amazing free heal from all the guys on the ground you just killed. Also, when tanking, this provides all the stamina we’ll ever need. Between Engine Guardian and this, your stamina should almost always be capped off. A nice, cheap ultimate to dish out damage, and AoE stun. This is the first skill to be played in my rotation. It’s Magicka boost is nice, the major mending is fantastic, and it provides the essential Major resolve and Major Ward buffs. A nice, well rounded cleanser, AoE heal, and AoE damage. It also provides the major mending buff as well. When playing healer, this skill’s cleanse, and synergy are critical. Our classic Templar heal skill. The reason we take Honor the Dead over Breath of Life is the magicka return. Combined with Engine Guardian, Channeled Focus, and our massive magicka recovery, you hopefully will stay maxed out on magicka. A nice movement speed buff. You can replace this for purifying light if you want the extra healing, or pierce armor when tanking. After the update, this skill isn’t what it quite was, but it’s still a powerful AoE damage ability, and its synergy is useful for dungeons. Our holy grail, self-healing ultimate. I love this for soloing dungeons, but if you’re a healer, then you may want to switch this out for practiced incantation. In the right circumstances, I drop channeled focus, ritual of retribution, throw a blazing spear, then bar swap and toppling charge over. After that I spam puncturing sweep. For tanking/healing I usually stay on my back bar. When tanking, I generally pierce armor and just block. With repentance, you can basically block forever if you are repenting corpses. When healing, honor the dead is obviously you bread-and-butter, but ritual of retribution and practiced incantation are also critical. For longer fights, focus on sustain, for burst damage, concentrate on practicing these steps: 1) Throw Blazing Spear 2) Toppling Charge 3) Dawn Breaker 4) Puncturing Sweep 5) Execute with Radiant Glory. I usually use a Magicka and Health bistat. For potions, any old Magicka trash pot will do. Whenever I play this build, I’m always surprised by its ability to dish out a ton of damage, while staying alive. Also, the sustain makes this build ideal for longer fights. I mostly use this for soloing veteran dungeons, but its versatility makes it useful anywhere. Thanks for checking it out! P.S. Shoutout to Deltia for the inspration! Great Build! Tried this on my Templar and it worked like a charm. Hello, is this build good for Trials? Thanks. Is this build workable with 2h sword / 1h sword&shield combo? Also, if I want to use this build from the beginning, what would be the best set gears? I just usually craft gears at level 10~20 and use them till 50.
maybe 5x rattle cage, 3x willpower and 4x seducer? or 1x monster and 3x seducer? instead of toppling charge i might use a destruction staff + elemental blocked? I love this build but I am more into tanking so could it work for tanking in pve aswell as pvp? Any chance for this set to get nerfed anytime soon and can i run it with breton templar and get same results? Looks like a great build and i want to give it a try, what passives are you using? Love your build mate, I have a Argonian still leveling at 23 now. Using 7 x Heavy armour – 5 x Magnus, 4 x Clever Alchemist (including 2 x swords & 1 x resto staff). Using ‘Witchmothers Potent Brew’. Have all attributes in Magicka and need no Health atm, haven’t died yet. Using all passives on Skills, Dual and Resto as I get points. Will probably use 5 x Alchemist (for the potion buff) and 4 x Magnus when at champ level. Don’t have vampire yet, but will for sure! Thanks again! Exciting to hear that this build is actually usable. So many builds seem to focus on light armor and running dual staves – that’s fine but no my desire to play. I really wanted something just like this. Just didn’t think it was doable! Is this usable with a Breton templar (seeing as how you would get a good resistance buff and still do the same neutral magic damage)? Or is that extra bit of recovery so important that you need Altmer? And what traits do we need on our gear? nvm I just saw our gear is divines, but what should our Mundus boon be? Magicka recovery? What race is the best for this build? Dumb question, but to perform tank don’t you need some kind of ability to draw aggro if you’re in a group of people? How do you get the big baddie to swing on you and not your un-optimized squishy mates? The description says that they replace Retreating Maneuver with a taunt when tanking. Ah, thanks. I also wonder, did you ever get an answer on Mundus Stone? I’d think the Atronach to make up for not running staves, right? Does anyone have a better Champion point setup for this build? That would be really helpful! Also can I use a dunmer instead of an altmer?